Avanquest WebEasy Professional is an easy to use web editor software that comes with a huge number of templates and e-commerce tools for creating website and publishing onto the web without the need of any programming or HTML knowledge. With WebEasy Professional, users can easily drag and drop to customize page layout, adding images, videos, music, text, RSS feeds, and change backgrounds. Besides that, WebEasy Professional also combines impressive features such as WebWidgets, photo albums, iPhone detection and redirection, shopping carts, Search Engine Optimization tools, and etc. Visit this promotional page(german): http://register.avanquest.com/ABSOFT/produits/Promotion/enregistrement_presse/register_cov_gd.cfm?idcgd=519. Fill out the registration form by entering email address (make sure the email address is valid), name, and other information, and then click ‘Hier erhalten Sie Ihre Seriennummer’ button as shown in below image. An email from “kontakt@avanquest.de” will be sent to registered email containing the conformation link, and click on “klicken Sie bitte hier” to receive license key for Avanquest WebEasy 8 Professional. Copy the Web Easy Professional 8 folder in “C:\Program Files\Avanquest” to another location. 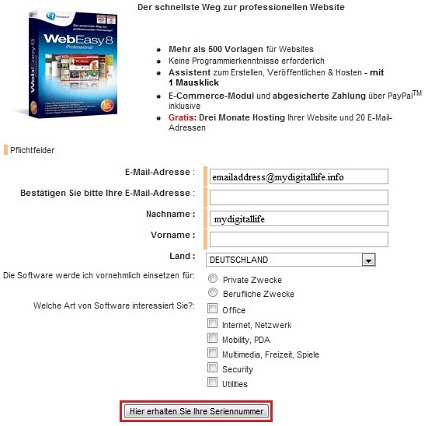 Download WebEasy 8 Professionanl German version from Avanquest German. Install the German version as paid version and enter the registration key to unlock the program. Copy the backup “Web Easy Professional 8” folder from the English version to “C:\Program Files\Avanquest” and rename first the German folder. Thanks to John for the tip. Avanquest WebEasy 8 Professional supports Windows XP, Vista, and Windows 7 (32- and 64-bit).